Excellent! 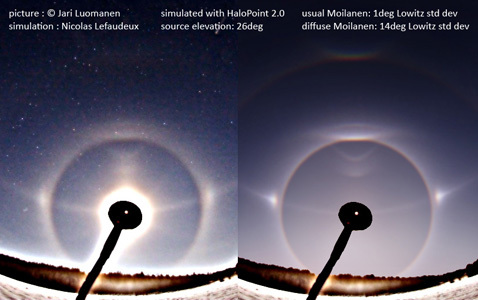 It looks like you got it right with Luomanen photo: the new halo is explained concerning the orientation and wedge angle. This will give new spice for the next diamond dust season games, we will be looking especially carefully when moon is high. Also, good simulations. You managed to create there nice sky illumination. That's already Avatar quality. Avatar!? I love that movie at one point when jake sull is up in the floating mtns of plante Pandora you can see a rainbow in the waterfall. Yes, Nicolas, the explanation of the feature in Luomanen's photo seems believable, since no modification of the wedge angle was needed. Good job! thanks! actually there seems to be a sort of "window of opportunity" for this arc to be identified easily. for source elevation lower than 15deg, the arc is very close to usual Moilanen. the identification is pretty difficult being only based on the shape an aspect of the arc which is pretty similar to usual Moilanen. this is what I tried to show with the two low source displays simulations. For source elevation higher than 30deg, the arc vanishes for tumbling angles of 14deg (similar to the one I found to simulate Jari's picture). I also link a image from Marko Mikkila showing faintly both this arc and usual Moilanen. the source elevation is similar to the one of jari Luomanen's picture. the tumbling angles are somehow larger to get a good match for this arc (20+deg) in simulations. Super job Nicolas! This is indeed ground breaking work! I just did a stack and USMed it heavily twice. Here it is.